The applicant cannot be a party who intentionally or negligently caused the release or potential release of hazardous substances at the project. If the property is not owned by a public entity, the city or county must endorse the project. The project must be accepted into the “Voluntary Cleanup Program” of the MO Department of Natural Resources. The project must be projected by DED to result in the creation of at least ten new jobs or the retention of 25 jobs by a private commercial operation. 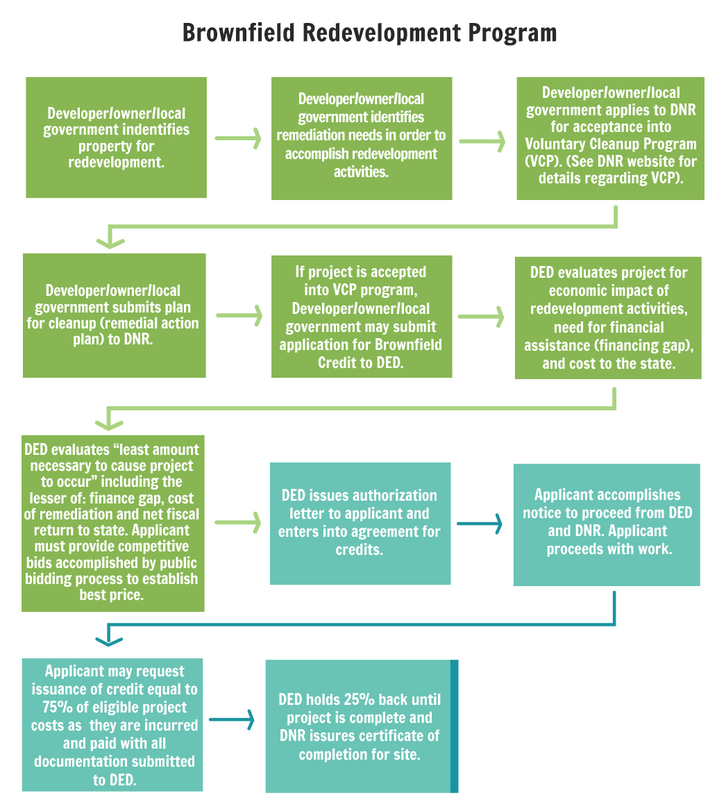 DED may issue tax credits for up to 100% of the cost to remediate the project property. DED will issue 75% of the credits upon adequate proof of payment of the costs; the remaining 25% will not be issued until a clean letter has been issued by DNR. The tax credit may also include up to one hundred percent of the costs of demolition that are not directly part of the remediation activities, provided that the demolition is on the property where the voluntary remediation activities are occurring, the demolition is necessary to accomplish the planned use of the facility where the remediation activities are occurring, and the demolition is part of a redevelopment plan approved by the municipal or county government and the department of economic development. The demolition may occur on an adjacent property if the project is located in a municipality which has a population less than twenty thousand and the above conditions are otherwise met. The adjacent property shall independently qualify as abandoned or underutilized. The amount of the credit available for demolition not associated with remediation cannot exceed the total amount of credits approved for remediation including demolition required for remediation. Notwithstanding any provision of law to the contrary, in any county of the first classification that has a charter form of government and that has a population of over nine hundred thousand inhabitants, all demolition costs incurred during the redevelopment of any former automobile manufacturing plant shall be allowable costs eligible for tax credits under sections 447.700 to 447.718 so long as the redevelopment of such former automobile manufacturing plant shall be projected to create at least two hundred fifty new jobs or at least three hundred retained jobs, or a combination thereof, as determined by the department of economic development. The amount of allowable costs eligible for tax credits shall be limited to the least amount necessary to cause the project to occur, as determined by the director of the department of economic development, provided that no tax credit shall be issued under this subsection until July 1, 2017. For purposes of this subsection, "former automobile manufacturing plant" means a redevelopment area that qualifies as an eligible project under section 447.700, that consists of at least one hundred acres, and that was used primarily for the manufacture of automobiles but, after 2007, ceased such manufacturing.